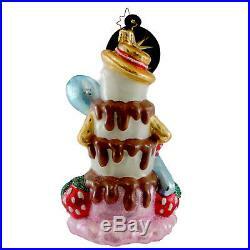 Christopher Radko SMORE SWEETS Blown Glass Ornament Snowman Chocolate. Approximately 5.500 Inches. New with tag – Made in Poland. Story Book Kids/ SBK Gifts ships every Radko glass ornament and/or finial with a Radko Logo box included unless specified’no box’ in the item’s description. Estimated Arrival Timeframe (Do Not Count Weekends Or Holidays). We will work with you to resolve the problem. SBK Gifts / Story Book Kids, 10725 Reading Road, Cincinnati, Ohio 45241. 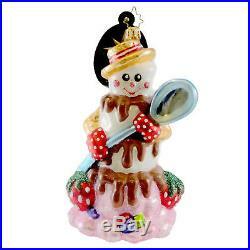 The item “Christopher Radko SMORE SWEETS Blown Glass Ornament Snowman Chocolate” is in sale since Wednesday, May 30, 2018. This item is in the category “Collectibles\Decorative Collectibles\Decorative Collectible Brands\Christopher Radko”. The seller is “storybookkids” and is located in Cincinnati, Ohio. This item can be shipped to United States, Canada, United Kingdom, Denmark, Romania, Slovakia, Bulgaria, Czech republic, Finland, Hungary, Latvia, Lithuania, Malta, Estonia, Australia, Greece, Portugal, Cyprus, Slovenia, Japan, China, Sweden, South Korea, Indonesia, Taiwan, South africa, Thailand, Belgium, France, Hong Kong, Ireland, Netherlands, Poland, Spain, Italy, Germany, Austria, Israel, Mexico, New Zealand, Philippines, Singapore, Switzerland, Norway, Saudi arabia, Ukraine, United arab emirates, Qatar, Kuwait, Bahrain, Croatia, Malaysia, Brazil, Chile, Colombia, Costa rica, Dominican republic, Panama, Trinidad and tobago, Guatemala, El salvador, Honduras, Jamaica, Antigua and barbuda, Aruba, Belize, Dominica, Grenada, Saint kitts and nevis, Saint lucia, Montserrat, Turks and caicos islands, Barbados, Bangladesh, Bermuda, Brunei darussalam, Bolivia, Ecuador, Egypt, French guiana, Guernsey, Gibraltar, Guadeloupe, Iceland, Jersey, Jordan, Cambodia, Cayman islands, Liechtenstein, Sri lanka, Luxembourg, Monaco, Macao, Martinique, Maldives, Nicaragua, Oman, Peru, Pakistan, Paraguay, Reunion.